The dual-channel turbocharger results in nearly instant power. Turbochargers have made the jump from performance cars and diesel truck engines to mainstream vehicles such as the Chevrolet Cruze and Jeep Renegade. The big effort now is to improve the resulting engine performance and vehicle drivability. Doing that will pave the way for automakers such as General Motors to use smaller engines to power the larger vehicles that U.S. consumers favor. BorgWarner addressed the issue for GM with dual volute technology, enabling GM to power its full-size 2019 Chevrolet Silverado 1500 with a 2.7-liter turbo four-cylinder engine. Turbos are often marred by lag, the slight pause in acceleration that occurs when the gas pedal is pressed down. That lag represents the moment it takes for the turbocharger to get up to speed. 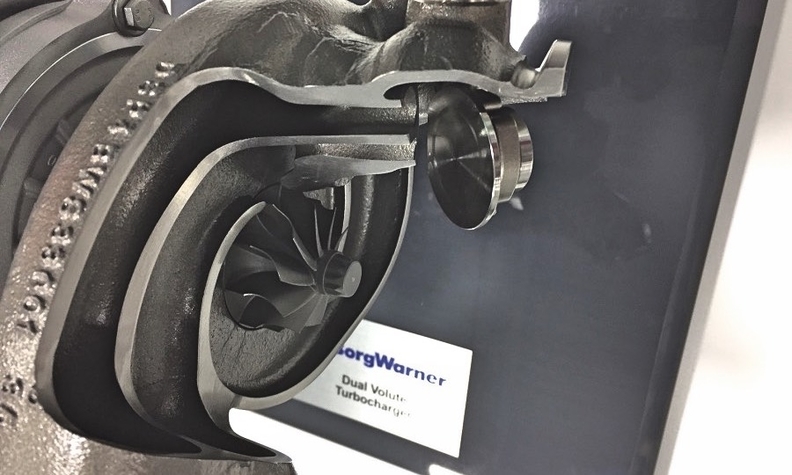 BorgWarner improved the acceleration response time by creating a turbo that uses two channels — or volutes — to route exhaust gas to the turbocharger impeller. The result is nearly instant power, which is extremely important for a big vehicle with a downsized engine. "Our engineering team recognized that a dual volute turbocharger could provide quicker engine response times for light-duty vehicles that require superior transient behavior," said Robin Kendrick, president of BorgWarner Turbo Systems.